HILL, MAURICE CAMERON (1919–1962). Cameron Hill was born Maurice Cameron Hill (he later dropped his first name) on February 7, 1919, in Rusk, Texas, to Annie V. and Henry T. Hill. Both parents were music lovers and encouraged their son to sing and play the guitar. The eldest of seven children, Hill began playing when he was nine. By 1930 he was playing guitar and singing on KLUF radio in Galveston; his father accompanied him on mandolin. Maurice Cameron Hill. Image available on the Internet and included in accordance with Title 17 U.S.C. Section 107. While still a teenager, Hill joined the Civilian Conservation Corps (CCC) in the mid-1930s and helped build roads and parks in East Texas. His cousin Truman Welch, also a guitarist, also joined the CCC, and together they played music at any venue where they could earn money. Hill and Welch performed with the Vance Brothers in Palestine, and in 1939 they joined Moon Mullican's outfit, the Night Riders. Later, Hill and fiddle player Leo “Micky” Lane moved to Illinois for several months, then returned to Texas and played beer joints with Shelly Lee Alley in Houston. In December 1939 Hill joined the Texas Wanderers who were being heard on Houston’s KXYZ radio. His first recordings were with the Texas Wanderers for Decca in April 1940. The band included pianist and singer Moon Mullican. When Mullican left the Texas Wanderers, most of the band, including Hill, left with him and they headed for Beaumont, where they played on KFDM radio as Moon Mullican's Texas Wanderers. When this band broke up in 1941, Hill went to Hot Springs, Arkansas, and joined his cousin Truman Welch to work with Pee Wee Roberts & His Skyliners on KTHS radio. Common Jazz Guitar, used by Charlie Christian. Image available on the Internet and included in accordance with Title 17 U.S.C. Section 107. In 1942 Hill joined the Village Boys, broadcasting on Houston’s KTRH radio during the day and playing at clubs in the evenings. While in Houston, he met fellow guitarist Jimmy Wyble, and the two became firm friends and headed for the West Coast in 1943. They were strongly influenced by the newly-emerging swing jazz form which gave a voice to the electric guitar, particularly that of Charlie Christian. 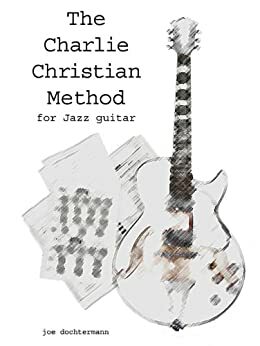 Hill and Wyble recreated Charlie Christian’s solos, which Hill could play note for note. Hill, Wyble, and noted steel guitarist Noel Boggs were playing in a small Los Angeles club where they met pianist Millard Kelso, who was playing with Bob Wills. Kelso suggested that they audition for Wills and set up the meeting. The three played with Wills at the Santa Monica Ballroom. Hill and Wyble made such an impression that they were hired on the spot; Boggs joined shortly after. At the time, Hill and Wyble set the standard for electric twin guitar leads and solos in western swing. Bob Wills and His Texas Playboys, 1944. Image available on the Internet and included in accordance with Title 17 U.S.C. Section 107. From 1944 until 1945, Cameron Hill played and recorded with the Texas Playboys and can be heard on Armed Forces Radio transcriptions. He also worked in movies with Wills, including Bob Wills and His Texas Playboys (1944), Rhythm Round-Up (1945), Blazing the Western Trail (1945), and The Lawless Empire (1945). In spring 1944 Wills organized his largest band to date, with seventeen instrumentalists and two vocalists. Hill and Wyble were the guitarists. But this version of the Playboys only lasted about six months. While with the Playboys, Hill met and married Wills's first female vocalist, twenty-four-year-old Laura Lee Owens. In December 1945 Hill and Owens left the Playboys and returned to Houston. Cameron joined the military, and Laura joined Dickie McBride's band. In 1946 they were divorced. Cameron Hill, pictured center, performing with the Cooley Band. Image available on the Internet and included in accordance with Title 17 U.S.C. Section 107. Cameron Hill performing at Cook's Hoedown Club, Houston, 1954. Image available on the Internet and included in accordance with Title 17 U.S.C. Section 107. 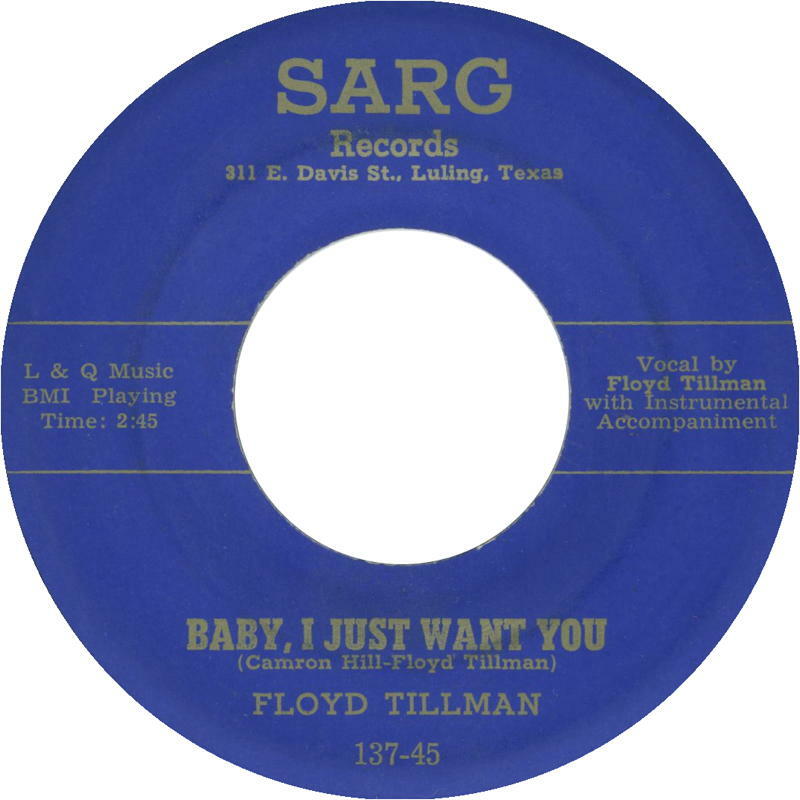 Floyd Tillman's Recording of Baby, I Just Want You. Image available on the Internet and included in accordance with Title 17 U.S.C. Section 107. Maurice C. Hill's Grave. Image available on the Internet and included in accordance with Title 17 U.S.C. Section 107. 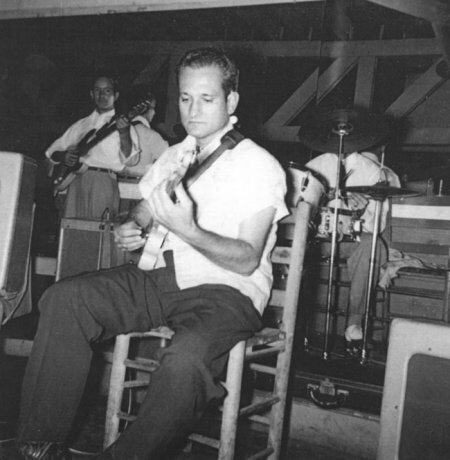 Hill worked and recorded with Dickie Jones and the Skyliners in Houston, but by 1947 he had moved back to Los Angeles, where he played on Roy Rogers’s recordings of With A Sweep of My Sombrero, Old-Fashioned Cowboy, and Betsy. Hill was then hired by Spade Cooley and reunited with Jimmy Wyble, who was also in the Cooley band. While playing with Cooley in 1948, Hill met vocalist Becky (Mary Ruth) Barfield, who had performed at the Grand Ole Opry and reportedly taught Eddy Arnold how to yodel. Hill and Barfield were married in 1949. Bob Wills’s vocalist Tommy Duncan left the Texas Playboys in 1948 and joined forces with his brother, bassist-vocalist Glynn Duncan. They recruited Cameron Hill, Jimmy Wyble, Millard Kelso, Noel Boggs, Joe Holley, and Ocie Stockard to form the Western All Stars. Hill, Wyble and Boggs left the All Stars in July 1949. Hill then worked with his wife in the Wade Ray Band, before moving on to lead his own band, the Texas Sundowners. The Texas Sundowners worked in Los Angeles and made regular trips back to Houston, where Hill, between 1951 and 1954, played recording sessions and worked with local bands. He moved back to Houston in 1954. In May 1955 at ACA Studios in Houston, Hill played on a session with Slim Whitman, which produced the hit, “I'll Never Stop Loving You.” In 1955 he played on Floyd Tillman’s recording, "Baby, I Just Want You," which Hill co-wrote with Tillman. Becky Hill passed away in 1958 in California. Hill left the West Coast, returned to Texas, and then went to Las Vegas to work in the Golden Nugget’s house band. He returned to Houston in 1961. In 1962 Hill, dogged by illness, moved in with his sister and brother in-law, Colleen and E.B. Wheeler, in Pasadena. His children, Rebecca and Cameron, went to live with family members in Pearland. Cameron Hill died in Houston, on June 22, 1962. He was buried at Rosewood Park Cemetery near Humble. Jean A. Boyd, The Jazz of the Southwest: An Oral History of Western Swing (Austin: University of Texas Press, 1998). Charles R. Townsend, San Antonio Rose: The Life and Music of Bob Wills (Urbana: University of Illinois Press, 1976). 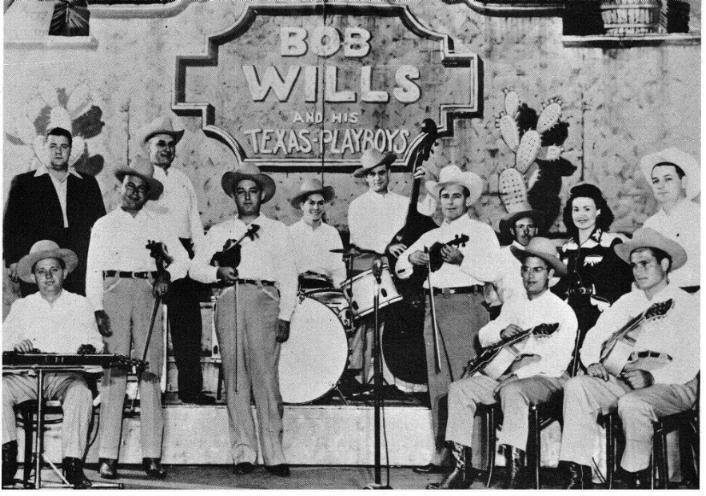 Kevin L. Wheeler, “Cameron Hill,” Bob Wills and His Texas Playboys (http://www.texasplayboys.net/Biographies/cameron.htm), accessed August 27, 2011. Handbook of Texas Online, Tony Wilson, "HILL, MAURICE CAMERON," accessed April 21, 2019, http://www.tshaonline.org/handbook/online/articles/fhi67. Uploaded on September 15, 2014. Modified on March 8, 2017. Published by the Texas State Historical Association.